You ought to drive down the road no 3 from Jelenia Góra towards Wrocław. Just past Jelenia Góra you approach Maciejowa (some kind of suburban town quarter) where you have to turn right to Wojanów into the narrow asphalt road between houses. 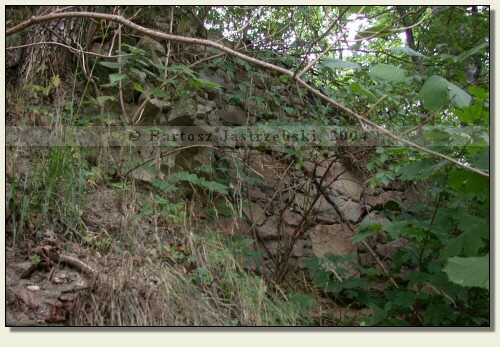 After covering around 100m there is a groove on the right side of the road and there just by the road, in brushwood the remainders of the walls have their place. There is not much known on the subject of the castle in Maciejowa. It was built in the XIIIth cent. and it was destroyed during the Hussite wars in the XVth cent.